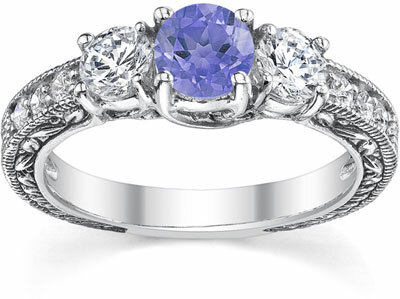 This lovely Diamond and Tanzanite Floret Engagement Ring in 14K White Gold is as pretty as a flower with its lavender gemstone prominently displayed at the center. The ring has all the qualities of an antique ring, yet is newly crafted to make the most out of the shining diamonds and polished gold. At the center sits a stunning tanzanite gemstone (5mm) that effortlessly attracts the light to its round-cut shape, while it shimmers and displays a rainbow shade of purple. To each side of the tanzanite sit a round-cut white diamond (0.50 t.c.w.) that adds more attention to the already appealing ring. The 14k white gold band (2.5mm-3.5mm) tells its own story with a remarkable display of antique-like carvings on the sides, while inlaid into the top of the band are 6 accent diamonds (0.14 t.c.w.). This engagement ring has a quiet, restrained quality to it with its soft, subtle tones of gold, white diamonds, and lavender tanzanite. It is the kind of ring that is appreciated for its sophistication, and becomes better and better with age. We guarantee our Diamond and Tanzanite Floret Engagement Ring, 14K White Gold to be high quality, authentic jewelry, as described above.